We knew we wanted the kids to attend some sort of school in order to really immerse ourselves with the culture, make new friends and for them to learn to speak Spanish, so we had done some research before leaving the states and had one school visit set up, Green Valley School, which we were looking at for Oscar. Green Valley is a preschool through high school, private bilingual school just outside of downtown Atenas with amazing views of the countryside. 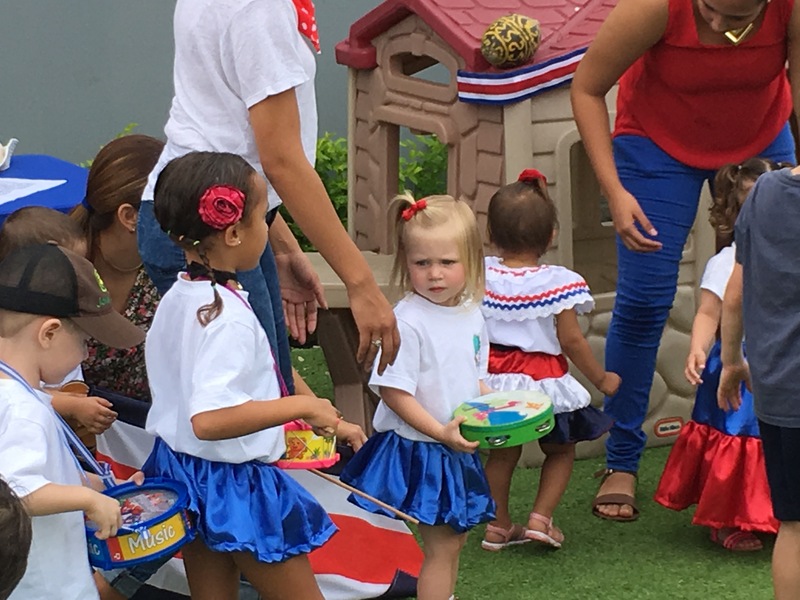 We toured the school a few days after we arrived in Costa Rica and decided we really liked the feel of it and thought it would be a great place for Oscar to attend. It took a few days for us to get him enrolled – they had to interview him and us, and of course we had to fill out all of the paperwork. Fun fun! Though most of the staff speak some English, it isn’t their first language and so everything was done in Spanish. For Palmer and I, it was an exhausting process trying to understand how it all works – where and when to pay bills (at the bank, not at the school or online), how pricing works (registration, monthly fees, activities), uniforms (where to buy them (in San José rather than in town!) and what all he would need and what size he would be and what days he wears the gym outfit (Wednesdays) rather than the regular outfit, what food he would need to bring (lunch, snack and water bottle) or should we give him money for the cafeteria, pickup and drop off and after school hours. It was at times confusing and we certainly didn’t know how it would all work out, but we also felt pretty accomplished in getting it done (and all in Spanish!) and having Oscar start school just over a week from when we arrived. Whew! But then the first drop off was a whole other story. Tears for me and my boy of course, but he did great and always comes out smiling. Since he’s at a school now rather than a daycare center, we drop him off at the door and the teachers make sure he gets to his classroom. It was so hard for us (and still is) not going to his classroom each day and seeing the work that they’re doing and chatting with his teachers to hear how each day goes. But we do have a ‘cuaderno de comunicaciones’ which seems to be a thing here. It’s a communication notebook that each student keeps in his/her book bag and the teacher writes notes to us about anything – how he’s doing in school, scheduling changes for the week, if he got hurt at school, etc. and we can of course let them know of any issues or questions we have. It’s old school, but I like it. We also have a WhatsApp group with Oscar’s teacher and all the parents in his class so we also see photos and get announcements that way. Overall, it’s been a great experience and Oscar is making some new friends. We met a German boy in the park over the weekend who is in Oscar’s class and they had a ball in the playground, chasing each other and playing hide and seek. We’re still learning all the kids names but it seems he starting to remember them all. As for Alice, we found a Montessori school in town that opened just in January that is perfect for her. The school is more like a daycare in that it offers care for children from 3 months old until 6 years old, though most of the kids are toddlers around Alice’s age. The school is filled with loving teachers who are passionate about early childhood development and show so much care and love to each of the students. Again, the process of getting her enrolled took a few days, a few visits trying to track down la directora of the school, and a few different conversations, not to mention a visit to the local emergency ambulance service across the street from the school to pay $40 in case she needs to be transported to a hospital or needs any medical services. This will cover her until the end of the year apparently. 🙂 I also loved that on the paper that mentions all the things we should bring in for her, one item said ‘colonia’ which I wasn’t sure about. So I asked what that was (believing it could not be ‘cologne or perfume’ for a baby), but alas, it certainly is. “Para que se huele bien” (so she smells good), they told me. I’ve now seen the many different Johnson and Johnson baby ‘colonias’ that the grocery store offers – many different scents to choose from for your babe. Alice’s first day also started with tears for both myself and her, but she also comes out smiling at the end of the day and they tell us that she does very well despite some tears for the first 5 minutes or so. After about a week, we dropped her off and she calmly walked away hand in hand with Miss Kimberly, one of her teachers. No tears! They say she is very expressive and is repeating lots of words in Spanish, and she gets so excited when she knows that we are there to pick her up. One thing I love about her daycare – they change her diaper, clothes and put her hair in a braid or pony as soon as we arrive to pick her up so she goes home fresh! AMAZING! She also has a ‘cuaderno de comunicacion’ so we know what she eats, how long she slept, etc. over the course of the day. They provide lunch (they have a cook that comes each day and prepares lunch for all of the kids) so she’s getting some good Tico food too! Every week they seem to have some sort of special activity – from a little excursion to someone coming in to give them a talk or do a special activity. And again, the director has created a WhatsApp group with all the parents so she is always keeping us informed about things to remember or activities coming up. Alice’s winning ‘Farol’ (lantern like thing that all the kids either make or buy for Día de Independencia) made with Palmer’s help. 🙂 Hers had the most recycled materials! Día del Niño (Children’s Day) happened to fall during the first week they were at school which is a pretty important day here, so both kids had special school excursions. Oscar went on a minibus to San José to watch a play about a dog (we didn’t get much info about the actual play as I’m guessing because it was all in Spanish but he seemed to enjoy it) and Alice went to Zoo Ave, a zoo not too far away that has rehabilitated a number of animals. We had no idea how they would take about 15 toddlers/babies the 20km to the zoo without strollers and lugging snacks/diapers/extra clothes for everyone, not to mention how the transport would work (we were envisioning Alice sitting on someone’s lap…yikes! ), but it turns out that everyone leaves their carseat at the center in the morning, they apparently install them in the taxis or minibuses and the kids walk once they arrive. It sounded like it all went well, but we did hear that they had to carry Alice for a lot of the time. Ha! We’re still adjusting to this new lifestyle and momma and daddy are learning to let go a bit…but also loving it as we know these are experiences that would just not happen in the states. Final thought: I didn’t think I’d like uniforms, but they are awesome. No need to figure out what to wear each day (and no fights about what to wear either)! Taking part in the special ‘acto’ at Alice’s school for Dia de Independencia.